All doctors of chiropractic must complete a rigorous and detailed education. After completing the necessary pre-med coursework, they begin a four-year program at an accredited college of chiropractic. The chiropractic curriculum includes detailed studies of: anatomy, physiology, X-ray, clinical sciences, spinal biomechanics and adjusting, preventative health care, and many other related topics. By the time of graduation, the average doctor of chiropractic has completed 4,485 classroom hours, compared to 4,248 classroom hours completed by a medical doctor. Most chiropractic colleges have extracurricular Gonstead clubs, where aspiring students can spend time in addition to the standard coursework in studying and refining their skills needed to excel in the Gonstead System. After graduation, doctors of chiropractic have many opportunities to further their education in the Gonstead System. The Gonstead Seminar is taught by renowned doctors who practice chiropractic consistent with the teachings of the late Dr. Clarence Gonstead. 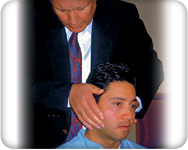 Through these seminars, doctors of chiropractic can earn advanced certification in the Gonstead System. In addition, this system has many researchers conducting ongoing studies to ensure that it is on the cutting edge. Licensed Gonstead doctors exist worldwide, offering their expertise in this highly advanced and results driven healing art.